Special thank you to My Fruit Shack for collaborating with me on this post. 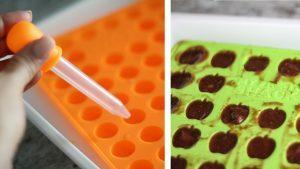 We loved trying out these gummy molds. As always all thoughts and opinions are 100% my own. My toddler Izzy LOVES gummies! So on my quest to feed myself and my family healthier foods I decided to create homemade, preservative free gummies! They are also gluten free and vegan. I failed on my first attempt, but if you fail, you try, try again.. right? These amazing molds are from My Fruit Shack. These are super easy to make and I made the recipe super simple with minimal ingredients. I made 3 types: cherry, orange and strawberry. 1/2 Cup Fruit (your choice) I used 2 oranges (fresh squeezed juice), strawberries and cherries (pitted). 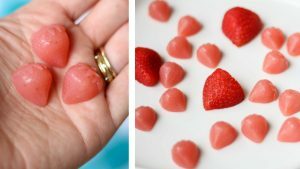 If you are making strawberry gummies, chop them up and cut off the top. Place them into a measuring cup to insure you have the right amount. Blend with water. 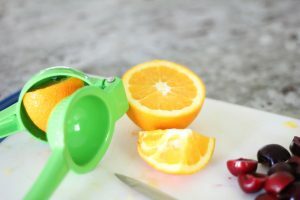 For oranges, cut & squeeze the juice into a measuring up. For the cherries, remove pits and place into a measuring cup. Pour cherries and water into a blender and mix. Pour water and fruit mixtures into a pot. Add the agar powder and optional sweetener at this time. Turn the burner on high and once the mixture starts bubbling turn to medium and keep stirring for 2-4 minutes until the mixture thickens. Use a dropper or spoon (depending on thickness) into the molds. 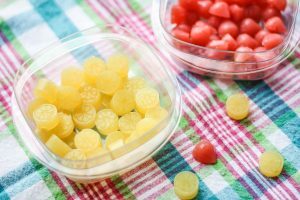 Freeze for 2 hours then pop the gummies out into containers and place in the fridge when not eating. These stay good for about 1 week. Have fun making these and enjoy! Yessssss! Can’t wait to make these! And the fruit molds are so, so cute!!! OHHH I just got some LEGO molds for Liam’s birthday, I need to make these! this recipe sounds so easy! 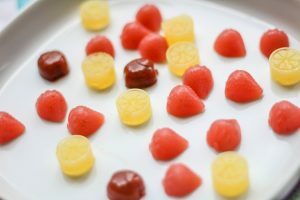 gummies always intimated me but I could totally make these! My kids are obsessed with gummies! I’m going to have to try this recipe out! These look amazing! I love the cute molds! These turned out so great! I definitely want to try this with my kids! Is it gummy or jelly?